Kia Stinger GT S. Cast aside brand snobbery and this classy Korean makes a true bargain supercoupé. Words Alastair Clements. Photography Will Williams. Do not adjust your set. That really is a Kia. In Classic & Sports Car. No, the world hasn’t gone mad, though it might seem so to those of us for whom the Kia Pride – the licence-built version of the Mazda 121 that signalled the South Korean brand’s arrival on our shores in 1991 – is an all too recent memory. 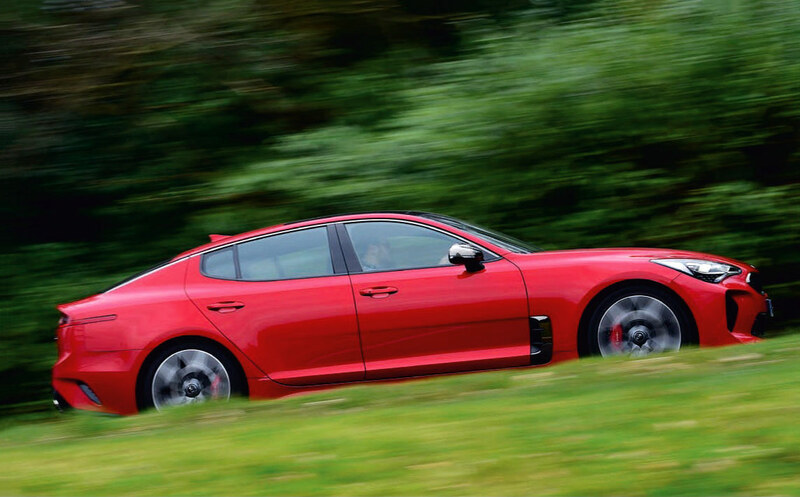 Kia sold just shy of 1800 cars here that year – which is how many Stingers it aims to shift annually in the UK, though very few of those are likely to be this flagship GTS version. Not many, then, but it wasn’t really made for us. It’s a statement car aimed squarely at the US market – hence the name which, like the looks, feels a bit shouty and brash for British tastes. Yet this car is a significant step for the car maker best known for cheap ’n’ cheerless hatchbacks and budget SUVs. This four-door coupé is the first Kia created purely for people who love driving. Just look at the spec: a twin-turbo 3.3-litre V6 up front, powering the rear wheels only (no four-wheel-drive safety net here) via an eight-speed paddle-shift auto, with four drive modes that include the option of disabling the nannying electronic intrusion completely. Hell, Kia even poached former BMW M man Albert Biermann to hone the Stinger’s chassis at the ubiquitous Nordschleife. So is it a cut-price M5? Er, no. But that’s not what it’s trying to be. This is a fast, hugely well-equipped coupé that will spend the majority of its life as a comfortable and capable mile-eater, but one that with a turn of a rotary dial becomes a tyre-smoking muscle car, capable of defying its near-two-tonne heft to make swift and entertaining progress along a favourite back-road. So not a class benchmark, or a high-water mark in the history of the automobile. We’re not suggesting that this is the BMW 3.0 CSL E9 or 911 Carrera RS of the future. Think of it more as a modern-day Ford Capri or Opel Monza and it starts to make sense. As a stealthily capable, boldly styled and bloody quick millennial interpretation of the GT concept, it’s undoubtedly going to win a loyal band of supporters – not least as a used buy, when it’s likely to fast become a serious performance bargain.